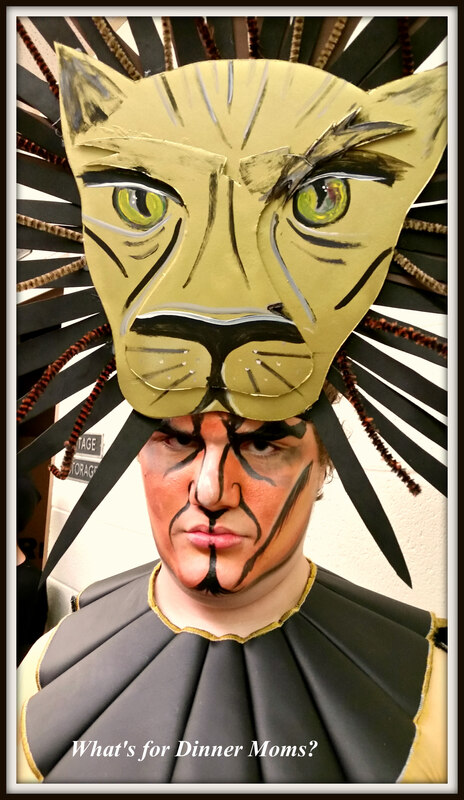 Lion King Jr. and Another Hill Climbed – What's for Dinner Moms? Five weeks ago I posted about my son and his audition for Lion King Jr. (click for link to original post.) I wrote about my son, his Autism and how he was cast as Scar. I have been away from blogging this weekend because this weekend he had his three performances. Friday night I sat in the auditorium before the show, terrified. I wanted him to succeed so much. I wanted him to do well and not be the smart, weird kid for once. I wanted people to see the funny, loving, and expressive boy that I see. As time came for the show to start I held my breath. He stepped onto the stage. Well, actually, he literally tripped onto the stage undoing his costume. Collective gasp from the audience. Gulp. But, then the boy who hates change, who has a hard time making mistakes, kept going like nothing happened. He said his lines. He held his costume in place and didn’t miss a beat. There was no yelling, no stopping, no melt down. He finished his scene and walked off stage. This might not seem like a big deal but for this boy it was HUGE! The tears started and didn’t stop until after the curtain. He did it. He succeeded. People clapped really loudly for him and told him what a wonderful job he did. People he didn’t know told him how good he was and he looked them in the eye and said, “Thank you,” to each and every one of them. Even now as I write this I am crying. This is one step closer to me believing that one day he will be able to survive without us. I know we have many miles to go but conquering this hill brought him such joy that I hope he continues onward breaking down the walls. Thank you so very much for your sweet words. Yay! Congratulations. That is wonderful! Oh my goodness, that must have been one very proud evening. Well done to your son and to you too. Wow this is so great to hear! Huge congrats to your son and his stellar performance! This is totally amazing! what a huge step forward! Your son is really an inspiration!! Thank you! We were truly amazed at how well he did. This is the third time I’ve gone back and read this and looked at George’s picture. I simply can’t believe he has come this far. What hope! Bet you are all still on a high and deserving of it! Thank you, Pat. We still have far to go but there was a time we never thought this would be possible. We will hold onto this feeling and remind him of all he has done for awhile. My daughter was in Lion King Jr. this spring. Hers was a wonderful production. I bet your son’s was too. So happy for him — and for you — that he shone this weekend! It was so nice. Such a cute show. This is so heartwarming. I can imagine how you feel. You are doing a good job and indeed, he will thrive. Pingback: What's for Dinner Moms?